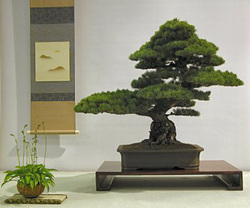 Lindsay Shiba will discuss elements in the display of traditional bonsai. Displaying bonsai is an art unto itself and whether you display your bonsai formally in a show or informally in your home or backyard, a creative and compelling display will give you and everyone who views it a new appreciation for bonsai. Lindsay began learning bonsai in 1970 from his father Katsumi Shiba. Lindsay continued his formal training under Khan Komai, who introduced Lindsay to the love of deciduous trees, accent plantings, and displaying bonsai. John Naka was one of his mentors and Harry Hirao is one of his teachers. He is a past President of California Bonsai Society, a show chairman of Baikoen Bonsai Kenkyukai’s Winter Silhouettes Show, and a member of Nampukai. Lindsay also teaches workshop courses at his family’s nursery--Mt. Fuji Garden Center in Upland, California. Beginner's class: Boxwood class continues.